Charles Bhebe was born in Lupane, Zimbabwe. As an artist, he is concerned with the human condition and the psychological impacts of our immediate environment. Taking his cue from everyday life in the city, Bhebe refers to his paintings as “urban narratives”. Throughout his work we see impressions of people doing manual labour, trading goods, taking selfies or simply waiting. Suspended above a washed out background or locked in beneath certifying stamps, his figures appear dislocated or at odds with their environment, yet they are never alone. 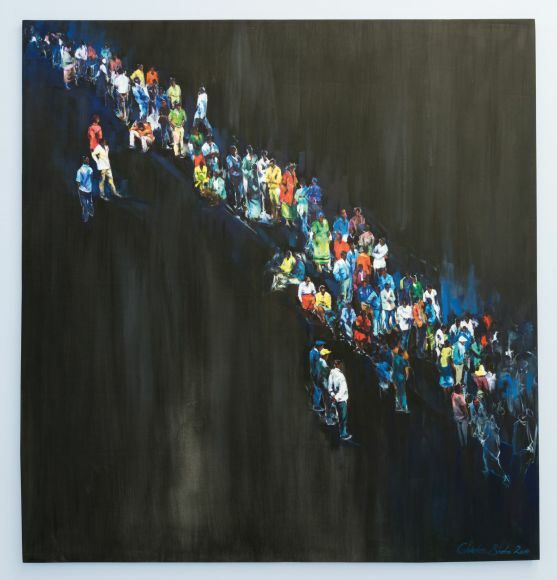 In the work titled, A Nightmare (2014) an endless queue of people extends from one corner of the painting to the other. Their forms float above an ominously dark backdrop. Some are seated. Others stand, waiting patiently. As described by the artist, this painting looks at the lingering threat to existence faced by so many, pointing towards the vulnerability and fears of a society pushed to its limits. 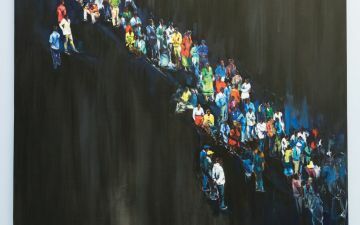 Although this painting refers to the difficulties faced by Zimbabweans during the 2008 – 2009 economic crisis, the people are brightly coloured, illustrating a sense of resilience and community. In 2017 Bhebe represented Zimbabwe at the 57th Venice Biennale. He has also been part of the Global Mural project in Düsseldorf, Germany a project organised by the Farbfieber Artist’s Association. 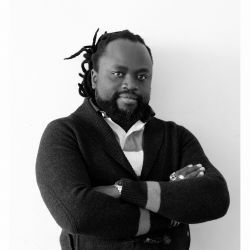 Charles Bhebhe work is featured in the Zeitz MOCAA exhibition, Five Bhobh – Painting at the End of an Era (2018 – 2019).